My Mom was an amazing woman. Sadly she died too young at 62, after living with metastases from breast cancer from age 54. When she passed, I consciously looked at myself, and my life, and realized that I did not want to die young. I reflected on some of the ways I lived my life and decided to take better care of myself; instead of give, give, giving as my dear mother did, to start setting better boundaries. Gabor Mate in his book When the Body Says No cites powerful evidence regarding “cancer personalities”. He shares how many of his clients who die of cancer give to everyone else and tend to put themselves at the bottom of the list; and rarely if ever show anger. My Mom was one of these people. She never had a negative word to say about anyone. She was the first one to be at someone’s home with a casserole when a friend or relative passed or got sick. She was creative; a poet and writer, and she did many crafts. She was warm, kind and thoughtful. Thank you Mom for all I learned from you. You were so patient. You encouraged my creativity. You trusted me and let me find my way, even though I was quite adventurous and from a young age loved to climb on play structures and hang upside down on swing sets. You supported me when I backpacked Europe by myself even though I’m sure you had some concerns about it. Thanks for always being there! I appreciate when you advised me to start coming home earlier at night in my teens as Dad was getting upset. Thanks Mom for all the songs you taught me. Now with my own grandchildren, many of those songs “are coming back to me”. I love singing them to my four grandchildren under three. Who knew! … Thanks Mom for loving me unconditionally. Mother’s Day is coming up soon. It’s an opportunity to tell your Mother how much you care about and value her. Whether she’s still alive or has already passed, I encourage you to write an open letter to your Mom. I invite you to share your reflections and comments below. Feel free to share this post with others. Am super proud and so admirative of my Mother. She is an example of resilience and my pillar. Aw! It is so true Leila. Yes our mothers are such fine examples of strength and resilience. Here’s to us and our mothers! I understand my mom so much more now that I am in my 60’s and understand where she was coming from. She had to deal with a lot of things we kids never new about and still make us and our home her #1 priority. She deserved so much more than she had. Even though she has passed into spirit, I am reminded every day how grateful I am to have had her as my mother. Aw Barb! It is so true that as we age we do better understand our mothers. I noticed that since my daughter became a mother she is so much more understanding and appreciative of me and my presence. Sorry to hear your Mom has also passed and great to hear that you are so grateful for having had her as a mother. Pamela, Thanks for sharing your story of Mom and how she has influenced your decision to have boundaries. Your gratitude is a beautiful tribute to her. I have written many letters to my Mom, including the story published in Chicken Soup for the Soul. I find the act of writing is healing and does connect me to her spirit. Hi Lisa, Thanks for sharing your thoughts and good for you to have written many letters to your Mom. It is so true that writing is therapeutic and connects us to one another. Thank you for this. Thank you for making necessary changes in your own life. ❤️ My relationship with my mother was complicated when I was growing up. She was a perfectly nice person but not the person I wanted to emulate. I am sure my distancing was hurtful to her even as it was necessary for me. I am grateful that she was someone I could grow up in opposition to as I wouldn’t have had the adventures that I have had without that capability. Now older, and she is deceased, I can appreciate some of the challenges she lived with, her courage and good will. I am grateful to her. When you have a beautiful Mother it leads to so much more joy in our lives. Beautiful post, Pam. You even look a little like your mom :). 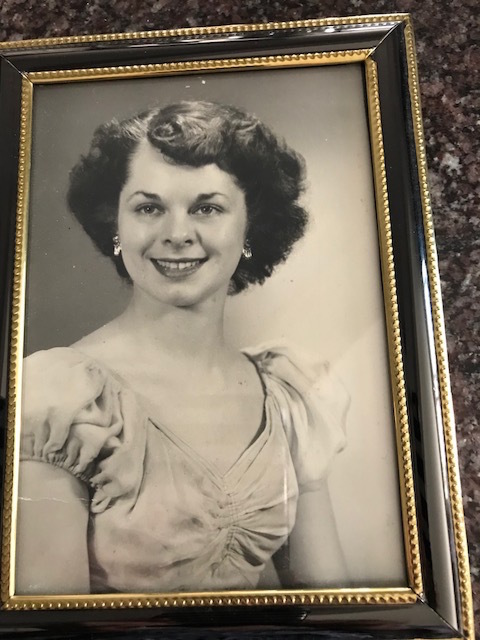 I too had a kind, loving, and rather empowered mom for her time. I have many of her physical traits, but she also gave me courage, compassion, and inner strength… and a huge legacy of the power of love. Her greatest wisdom for me was: To thine own self be true. Here’s to celebrating amazing moms and all those like them. Happy Mother’s Day to you, Pam!